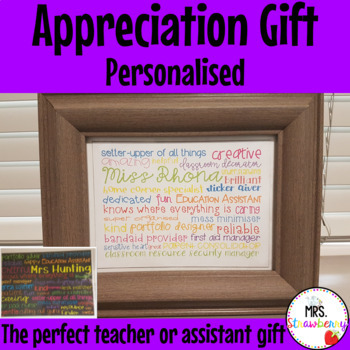 Give your teaching assistant a personalised and unique appreciation gift this year. 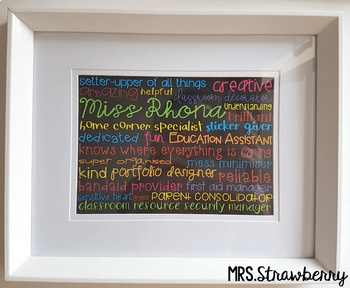 A great Christmas gift idea for your teaching assistant or your child's teacher. 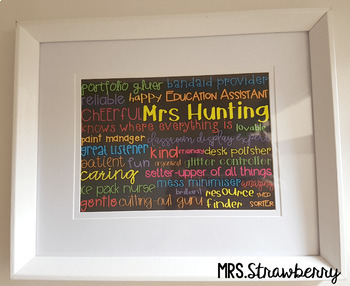 Select from a variety of words and phrases or completely customise to suit your needs. This is a DIGITAL FILE only. 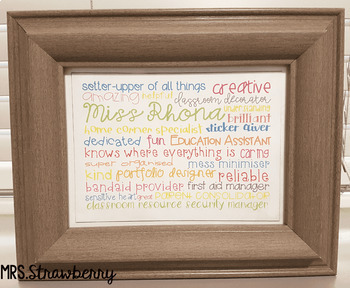 Your personalised gift will be emailed to you and you will need to print it yourself. This purchase is for ONE Personalised Appreciation Gift. If you require more than one item, please purchase additional licences at checkout. This is designed to fit a 5 x 7" (13 x 18cm) frame. The frame is NOT included. If you have a larger frame, please ensure that the mount board insert will fit the 5 x 7" image. You may request a different sized image on your order form, however this will incur an extra fee. The design will be centred on a white page and you will be required to trim it after printing. It is very important NOT to select page scaling in your printer settings. After purchase please download the order form and complete it as thoroughly as possible to avoid delays. This is where you will let me know of your personal requests. Orders will take a maximum of 5 days from receipt of the completed order form, but most will be sooner. If I am experiencing a high volume of orders I will let you know if your order will be delayed. I will endeavour to place all your requested words and phrases onto the poster, however if I am unable to fit them all I will contact you. The more words/ phrases you select, the better the image will look. Please select at least 20 words or phrases (or more if possible), for best results. Colours and fonts are randomly selected by myself and are not customisable. Poster size is 5x7” (13x18cm). If you request a different size, a AUS $2.50 fee will need to be paid via PayPal.